A line of Type 95 Ha Go light tanks destroyed on Biak Island. 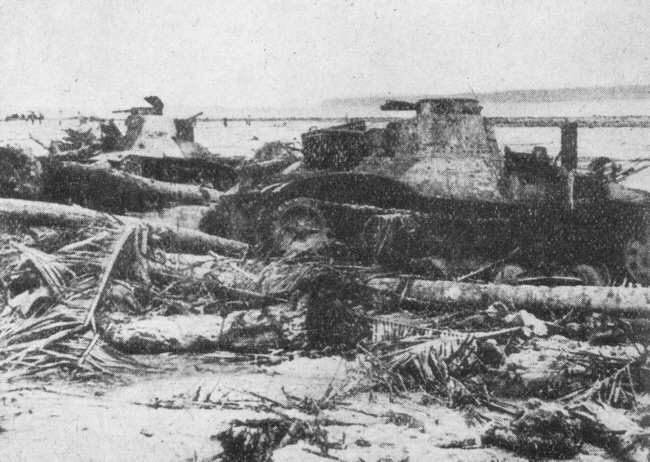 US troops landed on the island on 27 May 1944, but these tanks were probably destroyed in the fighting on 29 May when three M4 Sherman tanks destroyed four Type 95 Ha Gos attempting to defend the airfield. Although rather blurry, this picture does demonstrate the "see-saw" suspension of the Ha Go - the first road wheel on the tank nearest the front of the picture has been pushed up by the terrain, while the second road wheel in much lower.